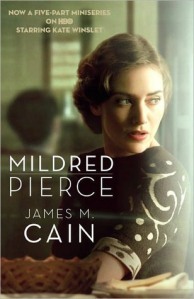 I plucked Mildred Pierce off of the shelf at Borders recently for one reason and one reason only. Perhaps I should be ashamed to admit this, but I am not. And I only continue to choose books based off this reasoning (which I will disclose momentarily), because it repeatedly proves true. What reason is this? Kate Winslet is on the cover. In the past it usually happened that I’d watch a film starring Kate Winslet , love the movie, discover that there was a novel the film was adapted from, go and find the book…. totally love the book. Some examples? Sense and Sensibility, Little Children, Jude the Obscure…. to name three. I believe that she just possesses a knack for choosing excellent projects and excellent characters. And it all typically aligns, quite perfectly, to my personal tastes. So, when I was recently wandering aimlessly throughout the bookstore, desperately searching for my next read, this seemed like a safe option for me to go with. So, did my decision to choose a book solely based off the actress on the cover pay off this time? It certainly did. Mildred Pierce had gorgeous legs, a way with a skillet, and a bone-deep core of toughness. She used those attributes to survive a divorce and poverty and to claw her way out of the lower middle class. But Mildred also had two weaknesses: a yen for shiftless men and an unreasoning devotion to a monstrous daughter. Out of these elements, James M. Cain created a novel of acute social observation and devastating emotional violence, with a heroine whose ambitions and sufferings are never less than recognizable. The character who elicits the most rightful rage, however, is the daughter, Veda. A snob since the womb, she demands that others grovel and beg for her approval and even after you do that (and anything else that she either directly or indirectly demands of you), she’ll despise you for doing it. Everyone has had a Veda in their life — even if the circumstances and annoyances were different — that one person that you just NEEDED to love and accept you. You’d do anything to ensure their never-ending approval, including, possibly, degrading yourself and forcing ignorance upon yourself. Conversely, you can let the irritation go and revel in Mildred’s accomplishments as she works diligently and takes all of the risks necessary to make her dreams come true. The novel is both inspiring and a hard, cold dose of reality. Overall, I would give this book three out of four stars (if I were to rate on a four star scale….) and look forward to, hopefully, seeing the HBO miniseries at some point in the near future.